New Glossier products & my thoughts! I recently ordered two new products from Glossier - Solution, and Lidstar, so I wanted to share my thoughts with you. A little background on each of these products, and then onto my experience! Solution: Unlike physical exfoliators that scrape off the surface of your skin, Solution gently sloughs dead cells away through chemical exfoliation, dissolving the bonds gluing problematic dead cells to the healthy skin beneath. With daily use, expect cleared acne and blackheads, smaller pores, and reduced redness. Skin’s texture will be smoother and softer, and the fabled glow of balanced, healthy skin will be in full force. Solution contains a particular 10% blend of three acid actives for maximum efficacy: Alpha Hydroxy Acid (AHA), Beta Hydroxy Acid (BHA), and Polyhydroxy Acid (PHA). Lidstar: Lidstar lights up eyes with a wash of soft, glistening color that lasts all day. The effect comes from a delicate proportion of ultrafine multicolor pearls suspended with coated pigments in a buttery base for the silkiest, most blendable formula. To apply, dab doe foot applicator onto clean lids and use fingertips to shape. The cream dries down to a sheer veil, locking onto lids with no creasing (no need for primer). It’s one-step eye enhancement you can do every day. Solution: I recently ran out of another toner that I was using, and I have to say, I really liked this...at first. I've been using it for about a full month at this point and haven't experienced any breakouts or other issues. HOWEVER, I think that it's drying my skin out. I had really high hopes and it worked well at first with my skin, but continued usage is making me second guess my initial excitement. Bummer. I feel like there are so many eco-alternatives out there as well that I don't feel like this one is worth it. 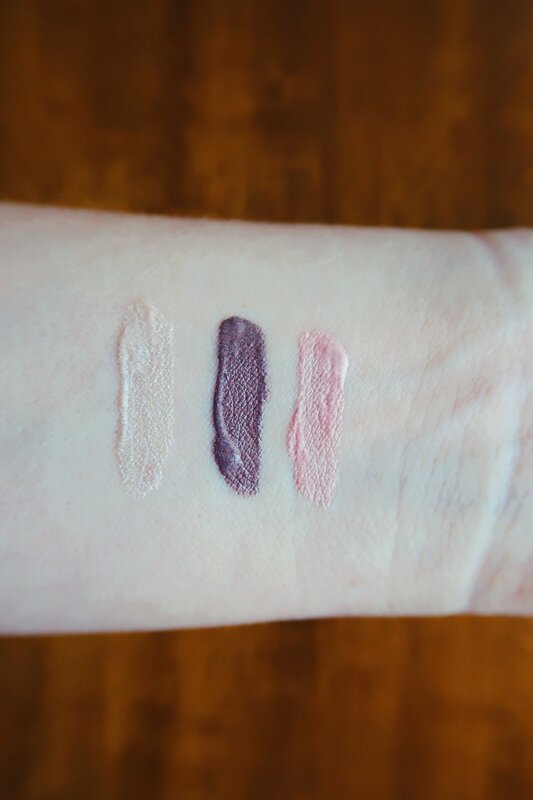 Lidstar: I tried Lidstar in three different shades: Moon (pales champagne), Slip (golden pink), and Fawn (smoky taupe). First, a little background on my taste in eyeshadow - nowadays, I really don't like "done" eyeshadow. If anything, I'll wear a quick swipe of highlighter or a very light brown cream eyeshadow, but never the elaborate eyeshadow looks I rocked a couple years ago. All this to say - I'm a pretty perfect customer for how Glossier is promoting lidstars. Overall, I'm impressed with the wear of these shadows, but disappointed in the payoff. Even for me, Moon deposits little to no payoff (like...I can't even tell I have it on) and I've had a similar experience with Slip. I do enjoy Fawn the most for everyday, and I think that I'll continue to wear this one on special occasions. Overall, if you can find a shade that works for you and you tend to favor lighter shades, this product may be perfect for you. But if you like a stronger eyeshadow look, definitely look elsewhere. Alrighty ladies and (gentlemen?) - there you have it! Has anyone else out there tried the Glossier lidstars or solution? Let me know in the comments below - curious on your thoughts! Jinjur Drops - The herbal blend I've been trying!